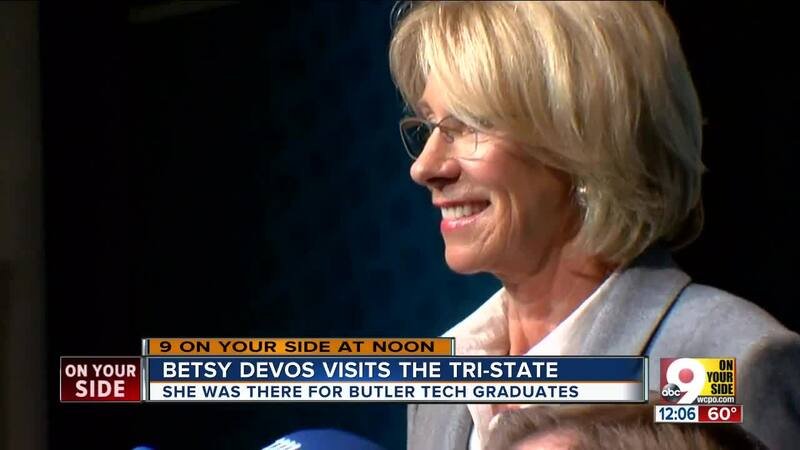 FAIRFIELD, Ohio — U.S. Secretary of Education Betsy DeVos participated in a signing ceremony Friday recognizing Butler Tech students who are graduating and will soon be entering the workforce. "You've made your families and all of us very proud," she said while giving remarks at the event. "And your achievements go far beyond your fancy diploma." Paula Dombrowski was one of the proud parents in the crowd cheering on. "I was in tears," she said. "I was definitely in tears. I had to text dad and say, 'I am trying to hold it together.'" Dombrowski's 17-year-old son, Kyle, got to give DeVos a one-on-one look at the machinery he operates, and gave her an aluminum block her made to remember her visit. "I milled it out of a model of a F-117, of the stealth bomber," he said. DeVos said, "It's fun to be at a place that's buzzing with that kind of activity in a region that really supports manufacturing." Kyle got a co-op with General Tool. He was one of more than 30 Butler Tech students to sign with employers Friday. "I'm pretty proud," he said. "It's pretty great to see my bosses out there and get recognition for all the hard work we put in."